Mark your calendars for this Saturday (November 29th) for the book launch of local author and business owner Carrie Rollwagen’s newest project The Localist: Think Independent, Buy Local and Reclaim the American Dream. Things kick off at 10 a.m. at Church Street Coffee & Books. 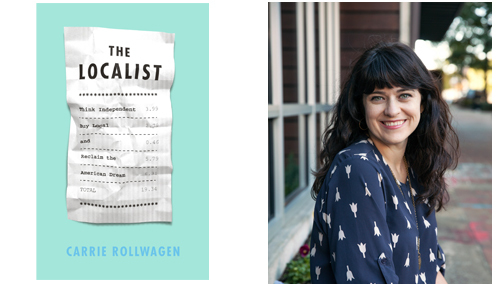 The Localist is a book that is near and dear to just about everything Rollwagen espouses. It’s a book. It’s local. It’s a way of life. I have yet to get my hands on a copy, but the premise sounds like the kind of book that inspires people to be aware of what is going on around them and could even save our sense of community.
. . . follow Carrie on her localist adventure as she embraces slow food, small business, the locavore movement, and many quirky indie shopkeepers and unique independent shops along the way. The Localist promises to not be anti-big-box store, just very very pro-local-indie shop, while offering tips on how to save money buying local and how to interact with the community. It’s a theme Rollwagen (@crollwagen) weaves into her writing whenever pen is put to paper or she sits at a keyboard. She blogs about buying local Alabama goods, she blogs at her local shop and she blogs about her writing. the book is available for pre-order on Kobo where there is also a pop-up short preview available with a little more to read. So check out The Localist event at Church Street Coffee & Books this Saturday at 10 a.m. There are also more upcoming events listed if you’d like to meet Carrie and check out the book some other time. I have no doubts this book is worth reading no matter where you live or where you shop.